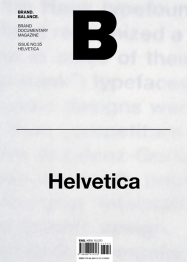 Helvetica is a typeface that was first developed in 1957 by the Haas Type Foundry in Münchenstein, Switzerland. Created to meet the social demand for practicality in 1950s, Helvetica was made to be more functional than decorative. It is now widely used in contexts from designs for public spaces and facilities in Switzerland to the digital interfaces of Apple products. Helvetica’s symbolic quality has earned the typeface recognition as a design icon—and as a brand.